Drought-stressed corn silage will contain lower levels of grain than normal corn silage. Photo credit Kristen Ulmer. 1) Chemical labels: If harvesting corn as forage or grazing directly, check the CHEMICAL and PESTICIDE labels applied to crops to ensure that the crop is cleared for forage and minimum pre-harvest interval (PHI) has been met. 2) Nitrate poisoning potential: Drought conditions can prevent normal plant growth, thereby higher levels of nitrates can accumulate in the corn stalk. Nitrates outcompete oxygen in an animal’s hemoglobin and can cause suffocation or even lead to death. Livestock do convert nitrate to other nitrogen compounds in the rumen, but it is the amount consumed and time it took to consume the forage that become the issue. Feedstuffs testing high in nitrates can be used as part of the ration if they are diluted with lower nitrate feeds. Talk with an extension educator about what could be blended and what ration could be balanced. 1) Feeding green: Green chop is chopping corn and feeding it fresh instead of first letting it go through an ensiling process. Nitrates accumulate in the lower 8-12 inches of the standing cornstalk in drought challenged corn. Setting the cutter bar higher and chopping the corn for green chop may lower the amount of nitrate fed. If feeding green chop, feed immediately after harvest and only feed the amount that the animals will consume in two hours. If green chop is left in the bunk or on the wagon, it can heat up and nitrate will be converted to nitrite. Nitrite is TEN TIMES as toxic as nitrate when fed to animals. Therefore, it is better to feed green chop 2-3 times a day to ensure that it is cleaned up quickly and not left sitting. Also, ensure that there is plenty of bunk space about 36 inches of space per cow, so the boss cows do not overeat and timid cows are allowed to eat their share. If nitrate poisoning is suspected, remove the contaminated feed from the diet, provide a high energy feed such as corn grain, and call a veterinarian immediately. Green chop may be a potential alternative for feeding some drought stressed corn, but one should do so with care. 2) Feeding as corn silage: This method is the most widely preferred as the ensiling process reduces nitrate levels by as much as ½ to 1/3 as the gas escapes as nitrous oxide compounds from the pile. Moisture LEVEL is key as excess can lead to poor fermentation or reduced feed value. Proper moisture is 65% with a range of 62-68% moisture. Delay harvest as long as there is some green in leaf and stalk tissue. Proper ensiling technique is key to success. 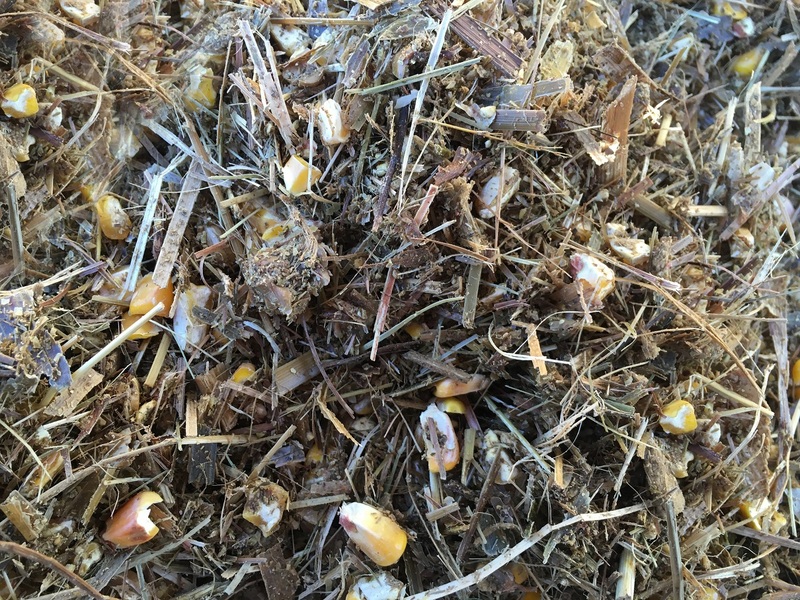 Below are a few articles on properly ensiling corn silage. Keys to successful ensiling and feedout can be found in the BeefWatch article “Silage Considerations." It is also a good idea to test the silage before using in a ration for moisture, crude protein, TDN and Nitrate content to allow for proper formulation in a ration. Tips for obtaining a good sample are provided in the NebGuide Sampling Feeds for Analyses. YouTube videos from the Silage for Beef Cattle Conference will provide more in depth information on producing and using corn silage in cattle rations . 3) Baling corn stover for dry feed: If corn grain is minimal on drought-stressed plants and silage is not an option, baling the corn stover for feed is a final opportunity. Cut the stover at 8-10 inches above the ground when a little green tissue is present and allow to dry down to stover for baling. Nitrates still exist in the corn stover and do not decline as it does in the ensiling process, so caution should be used when feeding. Sending in a sample prior to harvest will allow an initial look at nitrate levels. If nitrate test comes back high and at a dangerous level, cut the plants higher, 8-12 inches off the ground. 4) Grazing drought-stressed ears: If mechanical harvest is not planned, one can graze the drought-stressed corn standing in the field. Caution should be made in turning cows out to unlimited access of the field. Seasoned cows will seek out the corn ears before forage, meaning the cow will have a high grain diet and an increased risk of acidosis. Ensure that cattle are acclimated by increasing the amount of grain consumed over a week. Cows should not be turned out hungry on drought-stressed corn but rather fill them up on low nitrate forage beforehand. Consider also feeding high quality hay as a supplement and then moving to the corn field for a period of time during the day. Cross fencing and strip grazing areas will help to limit intake and reduce trampling while turned out on drought-stressed corn. Recall nitrates are an issue with higher concentrations noted as you move from top to bottom of the plant. Do not force cattle to eat lower portion of stalk as that is where highest concentration of nitrates exist. See the article “Graze Drought Stressed Cornstalks CAREFULLY” for more information on grazing. Options exist for utilizing drought stressed corn, but one must look at his/her scenario to determine which situation would work well with the risk taken. Drought-stressed corn can be utilized in several ways with careful management and care in feeding.